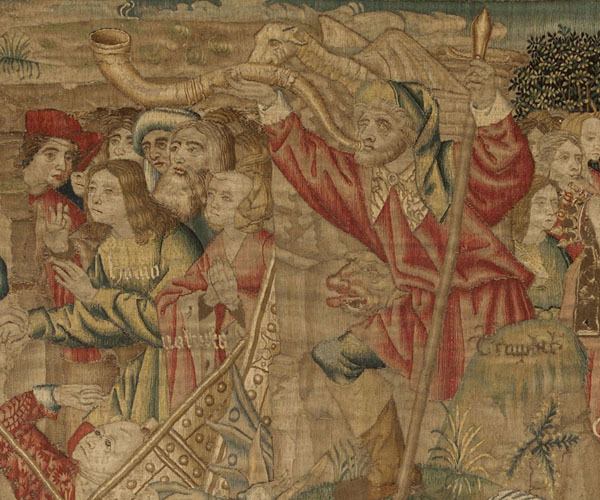 Two magnificent tapestries currently exhibited in the Cathedral of Burgos, usually known as the Vices and the Virtues, form part of a series comprised of ten pieces dedicated to the Redemption of Man by Christ, in which the Vices struggle with the Virtues. The panels were donated by Juan Rodriguez de Fonseca, bishop from 1514 to 1524, who ordered that eight tapestries from the series be shared equally between his last two sees, Palencia and Burgos. Unlike the tapestries preserved in Palencia, which have the escutcheons of the prelate sewn in them, in Burgos there is no reference to the owner. 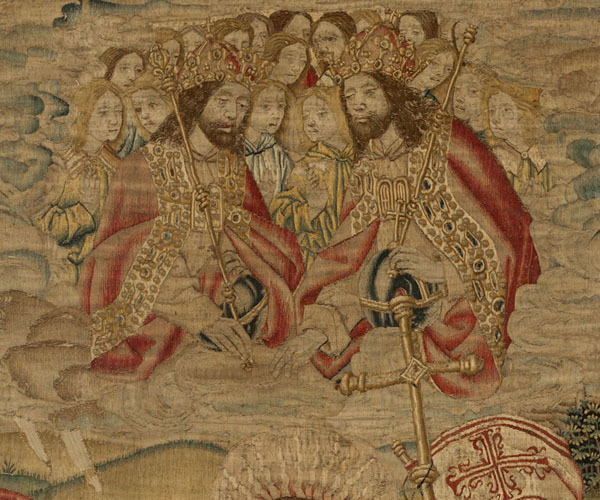 There is no doubt that they belonged to the bishop, however, because the documentation makes it perfectly clear: an inventory of 1560 confirms that ‘four tapestries of the Virtues [were] given by Bishop Juan Rodriguez de Fonseca’. We also know the delivery was delayed because the brother and executor of the prelate, Antonio de Fonseca, tried to keep the bequest for himself; when queried by the cathedral's chapter, he argued that the delivery was delayed in order to include the escutcheons of the donor. The bequest of Bishop Juan Rodríguez de Fonseca. The four tapestries bequeathed by the bishop – ‘Crucifixion and the Virtues win the Battle against the Vices’, ‘Resurrection of Christ’, ‘Birth of Christ’ and ‘Peace and Grace Obtain the Promise of Redemption for Man’ – were referred to as being ‘rich’ in the 16th century, thus proving their quality and degree of appreciation. However, nowadays only the first two still remain in the Cathedral of Burgos. The other two belong to the Metropolitan Museum of Art in New York (The Cloister Collection), after a sale in the 1920s. Those kept in Burgos are now exhibited in separate parts of the Cathedral: the ‘Resurrection of Christ’ in St James's chapel and ‘Crucifixion and the Virtues win the Battle against the Vices’ in St Anne's chapel. 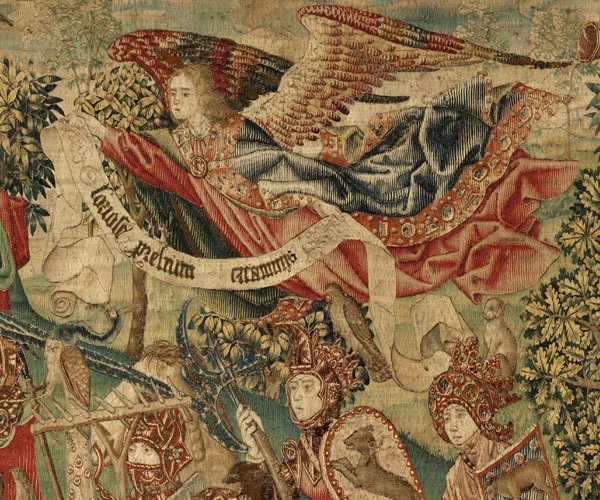 Belonging to the same series as those in the cathedral of Palencia, these tapestries in silk and wool are of remarkable size. Bishop Fonseca most probably bought them in the Netherlands, although they were made in Brussels workshops. However, the lack of marks makes it impossible to determine who the weaver was, and the author of the cartoon is also unknown. 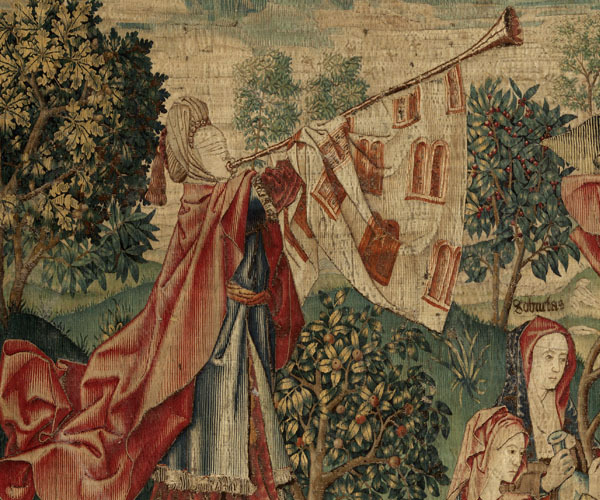 The tapestries show a remarkable number of scenes with no clear-cut separation among them. This is typical of the 15th century, although the style of the borders would seem to indicate that they were made in the first years of the following century. A. G. Bennet, Five Centuries of Tapestry from The Fine Arts Museums of San Francisco, San Francisco, 1992. A. S. Cavallo, Medieval tapestries in The Metropolitan Museum of Art, New York, 1993. M. Á. Zalama and M. J. Martínez Ruiz, “Tapestries of the cathedral of Palencia in the Musées Royaux d’Art et d’Histoire in Brussels: Bishop Fonseca, the sale of the canvases and the magnate Hearst”, Jaarboek Koninklijk museum voor Schone Kunsten - Antwerp Royal Museum Annual (2007), pp. 155-175.